Clipper City Brewing out of Baltimore makes some tasty beers! Like their Loose Cannon beer comes to mind! So when I saw them put out a "Session IPA," I figured I'd give it a go. 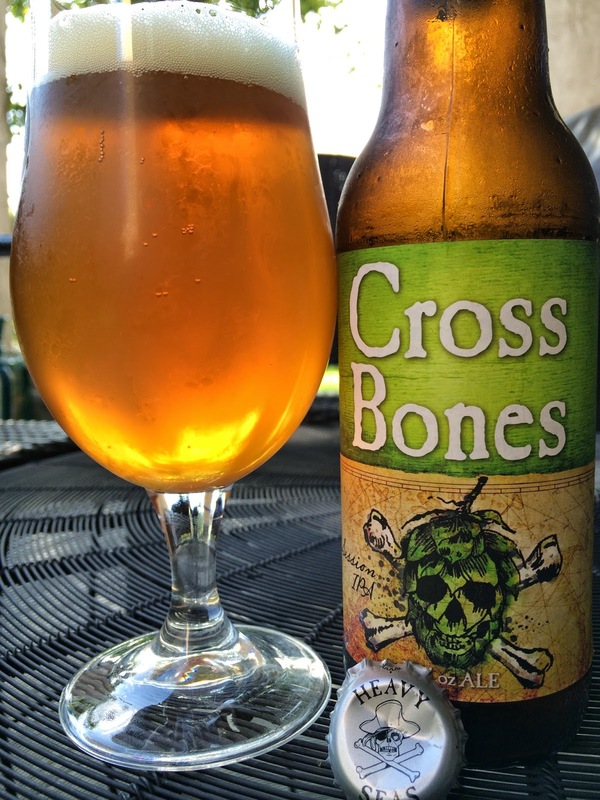 That happens to be Heavy Seas Cross Bones Session IPA. The label has a pirate cross bones theme, but the skeleton head is a hop cone carved out with facial features. This 4.5% alcohol IPA "delivers a broadside of flavor without getting your powder wet!" Best By Jun0715. Nice citrus aroma, spicy. Spicy hops start with some orange citrus and tangy flavors. A little floral too. But this beer tastes quite a bit soapy, very noticeable, really dragging on any refreshment I expect from a session beer. Lightly floral, decent citrus bitterness at the finish. But hard to get past the soapiness. There are at least half a dozen all stars on the Session IPA travel squad (and that's just the Florida distribution team). Cross Bones is OK but didn't even make the trip as a sub!